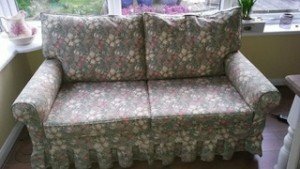 A two seater high back vintage sofa, upholstered in colourful floral patterned cotton with skirt detailing. 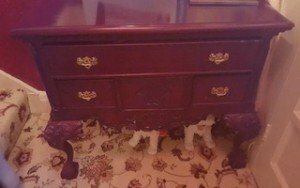 A vintage heavily carved chest of mahogany drawers on unusual shaped feet, having one large over two small drawers. 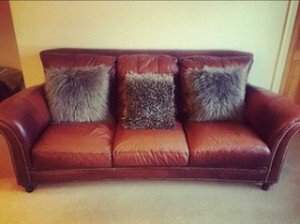 A three seater high back sofa on mahogany ball feet, upholstered in brown authentic leather, together with three grey throw cushions. 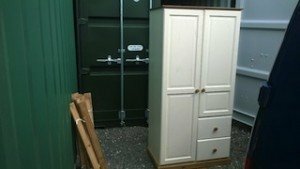 A hand painted white tall standing solid wood double wardrobe, having two small drawers to the bottom. 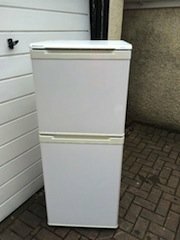 A small white Beko frost free fridge freezer. 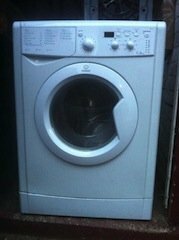 A white Indesit under counter 6kg 1400 spin washing machine. 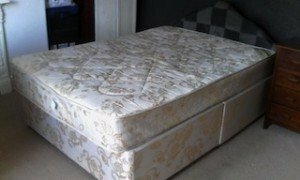 A cream and gold double divan bed base and matching double orthopaedic mattress. 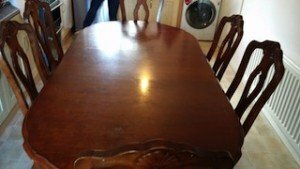 A vintage mahogany extendable dining table, together with six carved dining chairs, upholstered to the seats in cream damask patterned satin. 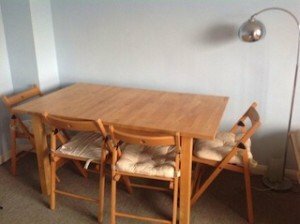 A light oak extendable rectangular dining table, together with four matching low foldable dining chairs. 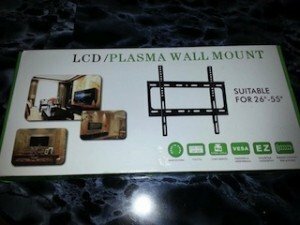 A brand new boxed 26-55″ LCD plasma black wall mount. 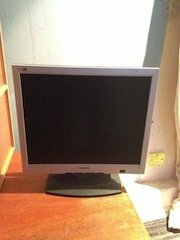 A silver and black Phillips 19 inch LED flat screen computer monitor. 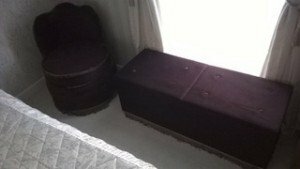 A large rectangular blanket box and matching small stool, both upholstered in chocolate brown velour. 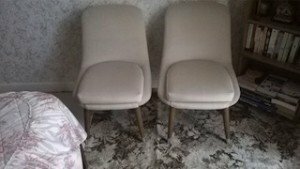 A pair of high back vintage bedside chairs on solid wood legs, upholstered in authentic cream leather. A tall standing frosted glass and solid wood vintage triple wardrobe on splayed legs. 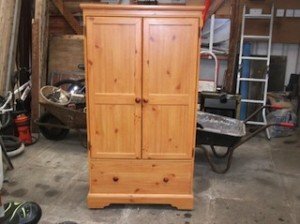 A tall standing solid pine double wardrobe, having two doors above a large drawers. 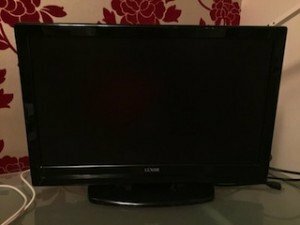 A 32 inch black flat screen Luxor LED Television with built in DVD player and freeview. 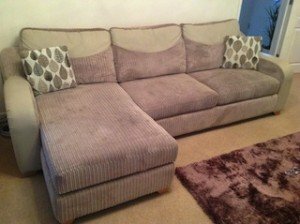 A four seater high back left hand corner sofa on pine feet, upholstered in lilac corded velour. 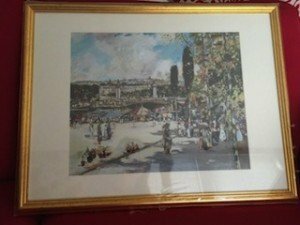 A vintage watercolour painting depicting a sunday market on a river scenery, mounted in a gold painted frame. 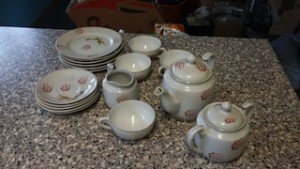 A vintage style red cloud patterned ceramic Japanese tea set, to include a teapot, a lidded sugar bowl, a milk jug, four teacups, four saucers and four side plates. 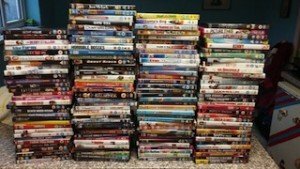 A large collection of adult and children dvd’s, to include Horrible Bosses, The Firm, Santa’s Dog, Eval Almighty, Battlestar Galactica, Nanny Mcphee etc.